The commercial use of unmanned air vehicles (UAVs), sometimes called drones, has taken off — literally! Over the past four years, Transport Canada has seen a more than 2,000% increase in requests for commercial permits to fly UAVs, mostly for taking aerial photos. But because many Canadians don’t realize they may need special permission to fly, the actual number of UAVs in use is likely much higher than these permits indicate. 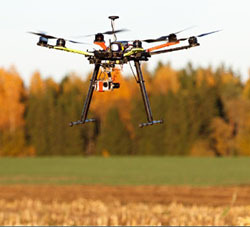 The agriculture industry began using UAVs to survey fields, but now also uses them for a variety of applications, including measuring the effects of wind and weather, conducting precision crop spraying, and gathering data such as soil patterns. This information can help farmers improve crop health and increase yield. You may need permission to fly. You are responsible for flying your aircraft safely and legally. If you are using a UAV to support your agricultural operations, you may need to apply for a Transport Canada Special Flight Operations Certificate (SFOC) . The process allows experts to review your specific situation and determine if extra precautions are needed. Learn about the conditions you must meet to qualify for an exemption on the Safety First website. If you do not meet all exemption conditions, you must apply for a SFOC. For more information, visit Transport Canada’s Safety First website.